Hand forged of genuine high-carbon etched Damascus steel by artisan sword makers, this Ten Ryu katana offers a massive 27" blade with a hand-sharpened edge that will slice with ninja precision. 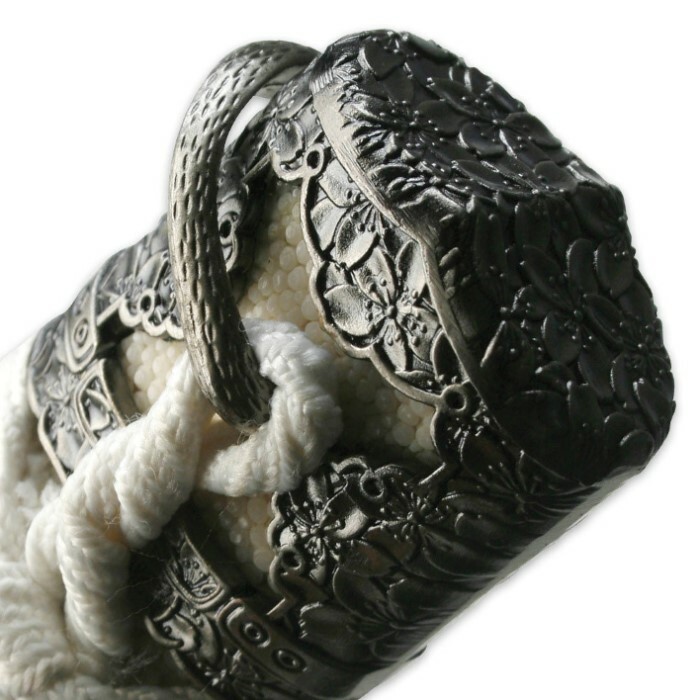 Stylish embellishments such as the cast Sakura tsuba, brass accents, genuine ray skin handle and regal white cord wrappings add tons of authenticity to this dramatic, fully functional collectible sword. The lacquered scabbard is hand painted and adorned with coordinating cord accents and attractive hardware. All of these exquisite elements culminate in a show-stopping masterpiece that will be treasured by true sword collectors. Strictly a display blade. Twenty minutes of iaido practice saw the ito (hilt wrapping) sliding around due to improper technique, (the guy who tied the ito, that is; my iaido technique is excellent). The sageo (cord on the saya) is tied in a very elaborate and impressive manner. It is looped, with the intention of being secured directly through the second wrap of the obi (sash), which is easier said than done without a manservant to help you. Alas, I am fresh out of manservants. Consequently, the saya and sageo combination proved quite bulky and not amenable to a traditional friction carry. The saya (scabbard) is raw wood, completely uncured. It's pretty on the outside, but there is sap inside of it, as well as sawdust, which sticks to the oil on the blade. This makes noto (sheathing the sword) a pain, as the sap will drag on the back of your hand, disrupting the intended fluidity of the motion and gettin' all in the face of my zen state. The balance is very far forward, even more so than Musha's economy line of swords. I've excellent blade control and lift weights four times a week, but even I found the blade wobbling slightly at the end of extended horizontal strikes. If you're used to a well-balanced katana, using this thing is like slinging a barbell around. The fittings are all obviously cast metal, but that was expected on a sword in this price range. The good part is that the blade proper is a very beautiful damascus forging which gleams nicely with a light coat of machine oil. The accentuated curve is unusual in modern katanas and quite pleasing to the eye. This is almost guaranteed to be the first sword in your collection to draw the eye of laymen, even though it's not really a very good weapon. So long as you don't plan on using this as a practice sword and are content with displaying it, I give it a tentative recommendation. I found this on sale a while ago, and it looked very nice when i took it out of the box. The gel on the inside of the sheath made the blade dirty, and when i cleaned it off, the blade started to rust, after i thoroughly wiped it off. The paint is very thin and the blade and guard are both loose. The blade is not sharp whatsoever, and is not worth the 80 dollars. 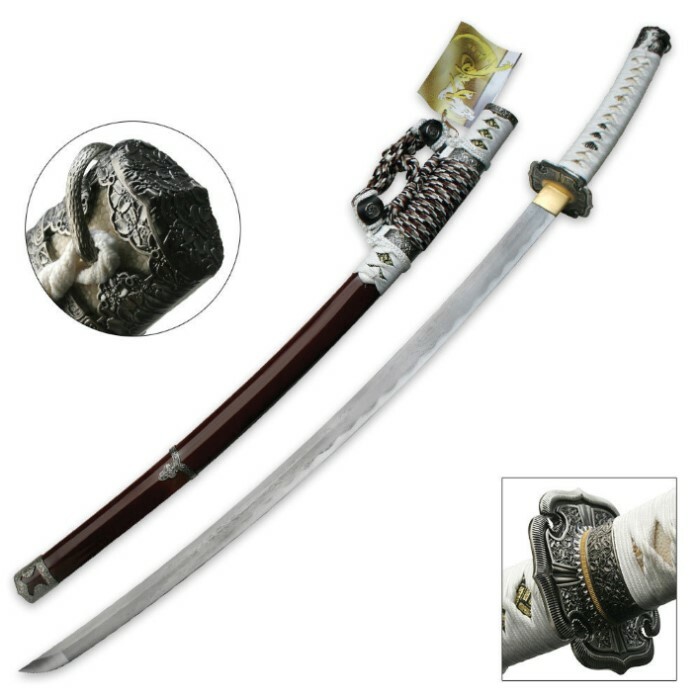 Although, I do recommend it for display, because the sword, when sheathed, looks very nice and has the appearance of a quality sword. Just received this sword. It is beautiful. 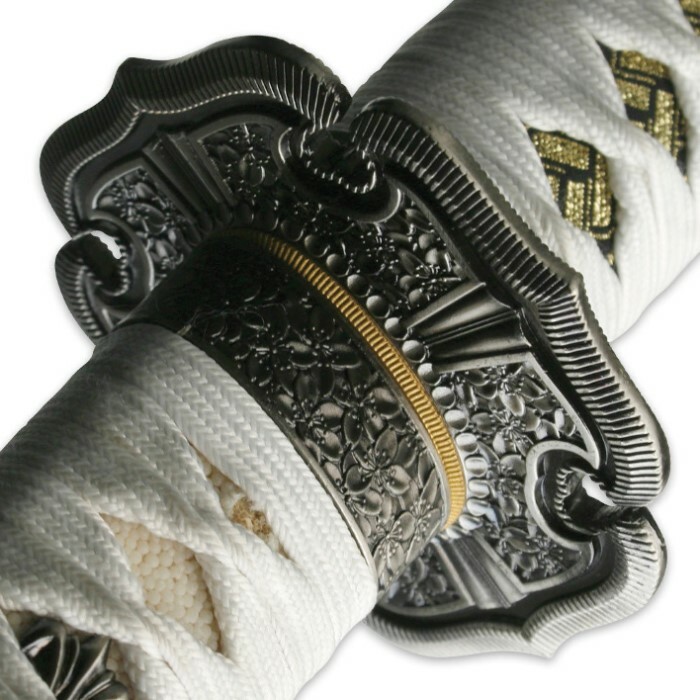 From the blade to the decorated Saya wich is beautifully wrapped to the intricate metal work on the tsuba. I give it 4 instead of 5 stars because it didn't come sharp as advertised. But other than that no complaints and for $80 bucks you can't go wrong. Also it is full tang and battle ready. very sturdy high quality and very pretty my complaint is it came not very sharp at all,the scabbard came red witch i didnt expect but i like it,if it came sharp it would be perfect. It arrived promptly, it's a beautiful weapon, the price was a good deal, and it nearly sliced my finger off! (I guess that's what I get for not being careful.) Very nice addition to my collection! The only two problems I have with it are that the end piece of the saya can come off without much effort and the sword can slip out a little too easily. Luckily, I can forgive these because I might find a way to fix them myself.